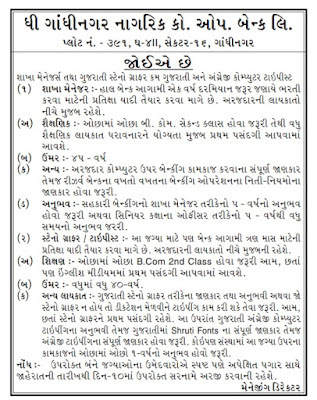 Home / BANK JOB / Gujarat Jobs / Gandhinagar Nagarik Co.Op Bank Ltd.Recruitment 2017 : For Branch Manager & Stenographer Posts. Gandhinagar Nagarik Co.Op Bank Ltd.Recruitment 2017 : For Branch Manager & Stenographer Posts. Name of Organization: The Gandhinagar Nagarik Co.Op Bank Ltd.